If you’ve seen a list of what decks were played at Worlds last year, you’ll notice that quite a few lists included Drifblim FB from Supreme Victors. Why did some of the top players in the world play Drifblim FB? Let’s find out! 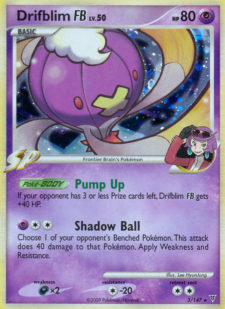 For starters, Drifblim FB is a Psychic Pokémon with an average HP of 80. The x2 Darkness Weakness makes it especially vulnerable to Honckrow, Tyranitar Prime, Umbreon and a few other Pokémon, but for the most part, it isn’t a terrible Weakness to have. The -20 Colorless Weakness provides some much needed protection against Garchomp C Lv.X. The CC Retreat Cost is certainly unfortunate, but Poké-Turn helps quite a bit. Its Poké-Body, “Pump Up” is a pretty good one (since its an SP Pokémon, it isn’t shut off by Dialga G Lv.X), if your opponent has 3 or less Prize cards left, Drifblim’s HP is raised to 120, which is quite impressive for a Basic Pokémon. 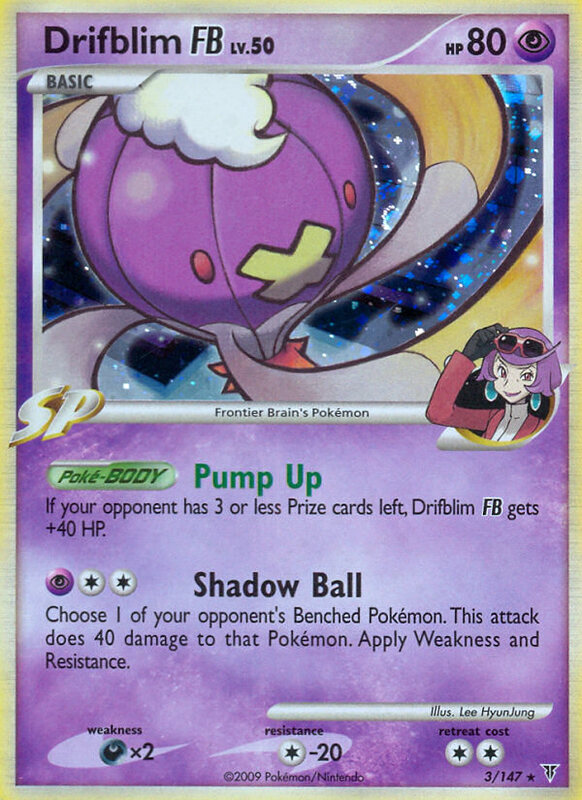 Drifblim FB’s single attack, “Shadow Ball”, is pretty good as well. For the high cost of PCC (Fortunately, we can use Double Colorless Energy or TGI Energy Gain to help power it up), it allows you to do 40 damage to one of your opponent’s Benched Pokémon. In addition, apply Weakness and Resistance. In case you haven’t noticed, both Uxie and Azelf, staples in almost every deck, have a +20 Psychic Weakness. What this means is, with the aid of Lucario GL or a Crobat G drop, you can OHKO these Pokémon while they’re on your opponent’s bench. Note: With a Crobat G drop, you can also OHKO a Uxie Lv.X on your opponent’s bench as well. While Luxray GL and Garchomp C can do this as well, by playing Drifblim FB, you’re given another Powerful attacker that isn’t hindered by any counter your opponent is playing (Garchomp C/Ambipom G/Dragonite FB for Garchomp and Toxicroak G for Luxray GL). In addition, if you’re running a Psychic Energy, which most SP decks are, you don’t need to add in any other Energy to the deck, which makes it easier to fit into your deck. I always try to fit it into my LuxChomp lists, whenever possible, but often times, I find there isn’t enough room. However, I make an effort to run it in any DialgaChomp decks I create because, in my opinion, it works better here as it sort of gives you the ”best of both worlds” between LuxChomp and DialgaChomp. You’re given the power and tanking ability with Dialga G and Garchomp C, and Drifblim helps to provide a higher level of sniping that isn’t really known in many decks apart from LuxChomp. My Recommendation: If you’re playing LuxChomp, DialgaChomp or any other SP variant running Garchomp C (Sablelock/Chenlock may be an exception, I haven’t tested it a whole lot in either of these two decks), I strongly suggest you give it a shot in your build. It can take a bit of time to get used to it, but once you do, it’s well worth it. I’ll admit, I expected a section about how beast this guy is during sudden death. I mean, the Body is always active during sudden death, so he’s an awesome tanking machine. Of course, the downside is that it can only attack benched Pokemon. While this is awesome if you’re taking on VileGar, it can be a real liability if the only thing your opponent has benched is Dialga G.
Is there any poke besides this who applies weakness and resistance, when hitting bench? love this card, was one of the first holos I pulled in new booster packs, got some real sentimental value haha! Plus not a bad late gamer! Keep up the use the new (and much better) reviews Dakota! Oh My, He’s On Fire! BC Regionals Report + What Happened to 130 HP?